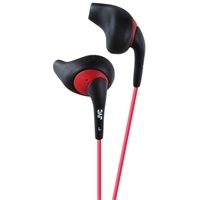 Black and red Splash proof Gumy Sports headphones ideal for sports. Secure and comfortable fitting with Nozzle fit earpiece. 3.3ft (1.0m) color cord with iPhone compatible plug M/L. Nozzle fit earpieces included. Earpiece allows for ambient noise for safety.